The Medline K-1 Wheelchair features a durable, tig-welded frame with a grey powder coat finish. The seat is adjustable to serve as both an adult and a hemi seat, and is covered in comfortable nylon upholstery. This chair features smooth-rolling, flat-free solid tires and front casters. With a spare, elegant design, this wheelchair is perfect for all users. Use this to figure seat width if it is the widest point. Measure the widest area across the lower extremities if different from the hip width. This may influence seat width or arm style. 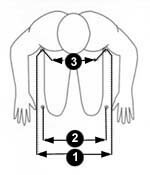 Measure the widest point of the thorax just below the arm pit. This measurement may influence system width or back width. Use this for legrest extensions and seat height. This will determine the seat depth. Measure this width with the arm in a 90 degree angle at the elbow and the shoulder in a neutral position. This will determine the height and the style of the back panel or the start for a custom back. This will help determine the proper headrest height. Overall width: 16" - 18"